This image is from mid-May of 2007, taken along a roadside pullout near Vantage, Washington. I don’t think I’ve ever mentioned why I visited this particular area. While attending a lecture / book launch by Mark Turner (I’ve reviewed the book, see the reprint in Botanical Electronic News: Wildflowers of the Pacific Northwest), Mark made mention of a locale near Vantage that had “wildflowers and bullet hole-riddled washing machines” as well as the “natural rock garden” look shown in the BPotD entry linked above. Sounded intriguing. Obviously, I managed to find the natural rock garden on my trip in May, but the search for the washing machines and ilk ended in failure. Brent Hine and I returned to the location in mid-July, as part of the Intermountain Expedition. The small detour to Vantage was specifically to collect seeds of this plant, Oenothera pallida or pale evening-primrose. The heat was oppressive, in the upper 30s C (96+ F). We didn’t stay too long in the area because of the temperature, but we did explore the locale a bit further away from the highway – and, lo and behold, we found the rusting washing machines and fridges, complete with bullet holes. Of course, this brings to mind the thought that the area occasionally has people making the holes, who I doubt are too interested in the local flora. Oenothera pallida is a species of western North America, found in well-drained, sandy soils of the sagebrush steppe (you can tell in this photo that these are growing in small sand dunes). 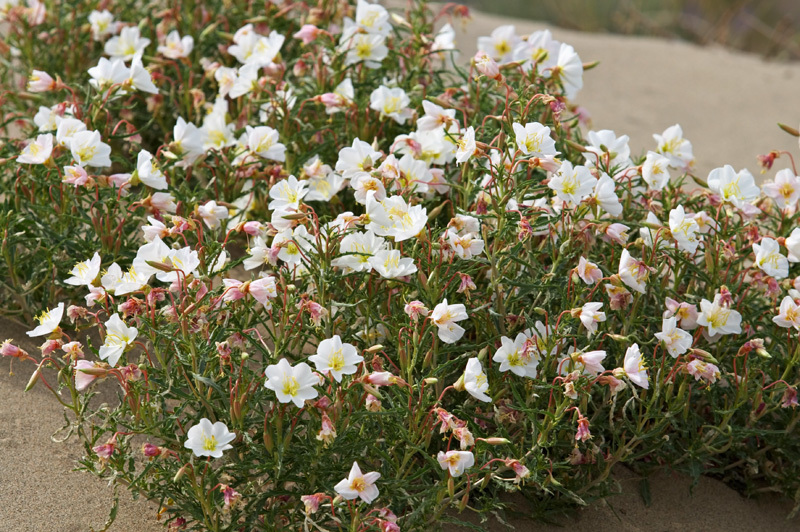 The Burke Museum has a number of photographs of Oenothera pallida, most of which were taken in the dunes near the Dallesport Airport in Washington. Incidentally, this is an area we tried to visit as part of the expedition, but without a guide to show us how to access the public areas, we could only find fences. Southwest Colorado Wildflowers also has a number of photographs of Oenothera pallida, including images of the immature capsule. Oenothera, ee-noth-e-ra [correctly en-oth-e-ra]; from Gr. oinos, wine, and thera, pursuing or imbibing, the roots of one of the species [or an allied plant] being regarded by the Romans as an incentive to drinking. Plant Names Simplified, Johnson and Smith. Did the Romans need an incentive for drinking? Just curious. Did you get any shots (no pun intended) of the bullet-riddled appliances?!? Laura, that’s for another trip (next spring, perhaps? I’ve put it on my calendar). Brent’s correction on the temperatures (45C) points to the reason why I didn’t take any on the return trip. Thanx for giving me the opportunity to see this plant ‘in the wild’. I plant my seed indoors every spring and do not put them outdoors until June. Now I see why! And of cause they die at first frost…..
Leave a Reply to fotrristi Click here to cancel reply.